To throw a shoe at a man in Dundee is the equivalent of a kiss on the cheek and an embrace in London. Dundee is a very different place; they have their own rules. The thing is, any time anyone invades anyone on stage, the invader always looks really bad no matter what point they’re proving – obviously that applies to myself too. I’m not good at interviews, I’m not good at dancing, I’m not good at looking like I’m having fun. I never will be, I don’t think. Unless I go to a life coach. I’m not angry, I’m not an angry person, but I do sometimes like playing with the perception of anger, as in pretending that I’m more angry than I actually am, and sometimes it works quite well. I have legendary massive breakfasts at hotels. I don’t hold back. I’ll get there at 7A.M. and I’ll be the last out at 11 A.M., having gone up and down the buffet seven times. Reaching the height of 6 ft. 5 in. ; I never expected to be that tall. I just shot up. I’m not trying to be a celebrity, Justin Timberlake kinda guy. I try and sit on the fence because as soon as you voice any kind of opinion, people begin to think you’re an idiot. I know how to treat my voice to make it sound as good as it possibly can – which is still not that good. 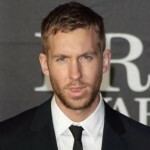 Calvin Harris was born in Dumfries, Scotland. He is a Scottish singer, songwriter, record producer and DJ. His gold-selling debut album, I Created Disco, was released in 2007 and contained the top-ten singles, "Acceptable in the 80s" and "The Girls". His second studio album, Ready for the Weekend, reached number one on the UK Albums Chart and includes "I'm Not Alone", which debuted at number one on the UK Singles Chart, the top-five hit "Ready for the Weekend", and the singles "Flashback" and "You Used to Hold Me". In October 2012, he released his third studio album, 18 Months. He released his fourth studio album, Motion, on 3 November 2014. According to Forbes, Harris was the highest-paid DJ of 2013 and 2014.